After gastronomically delightful stays in Delhi and Agra that I detailed in Foodie vacation and foodie vacation continues in Agra, we move on to the city of Amritsar. The scary incident in the train notwithstanding, we looked forward to our stay here. And the city delights every single time I visit. After we reached our hotel, quickly freshened up, we were ravenously hungry. So we headed to the famous “Bhrawan da Dhaba” or Brother’s dhaba for breakfast. They have two dhabas next to each other owned by two brothers. The cycle rickshaw ride was still a novelty for kids after their first foray at Chandni Chowk. Yummy kulche with chhole and curd at Bhrawan da dhaba! What I loved the most is the sweetness of Punjabi language. They eat up most vowels and even their Hindi is heavily accented and sometimes very difficult to understand. One phrase they use regularly is “Chal, koi baat nahin!” Loosely translated it means, “All is well.” After that digression and you will find many in this post :), let me come back to Bhrawan Da Dhaba. The place is very clean with decent seating. They suggested we try the famous Amritsari kulche. We took paneer, gobhi, mooli and aloo kulche. They serve two stuffed kulche in one thali with Amritsari chhole and thick curd. The food was beyond delicious. Kulchas done in pure ghee to perfection and very yummy. The Amritsari chhole were heavenly and the curd was sweet and perfect, the best I’ve had in some time. A panoramic view of the gorgeous Golden Temple! Satiated we headed out and paid our first visit to Golden Temple. It is still as beautiful and serene as I remember it. The golden structure casting a delightful reflection in the calm pond of nectar which has pretty large fish in it. As soon as you enter and submit your shoes, you are struck by the devotion of volunteers. The volunteers sweep, mop, keep your shoes, give you water, clean utensils and man the langar services. It is just overwhelming. But the most striking feature is the love with which they do it. Remember to keep your head covered at all times. I loved the colourful patialas and shalwars that the Punjabi ladies wear and the handsome sardars in their colourful pagdis. And they do address women with a lot of respect. I must tell you this incident that happened when we were queuing up for darshan. A lady next to me, a tourist, received a phone call (It is another matter that your phone must be kept on silent). She started doing some matchmaking loudly. “The girl is an MBA, works in HP,” she began. Fair. Fair. Fair! She emphasized 3 times till the person understood. 57 she said next. “I told you 57 so you can imagine the figure,” She bellowed. Some people including me glared at her. She went on dissecting a poor girl’s anatomy till she reached the head of the line when those minding the queue made her switch off her mobile. What people! After that we had our fill of the Kadah Prasad which is very tasty. We ate at langar late afternoon. The simple meal of Maa ki daal with some potato curry and rotis was very delicious and deeply satisfying. There is something magical about sitting in a large community hall irrespective of caste, religion and social status and partaking of food made with utmost devotion lovingly served to you. 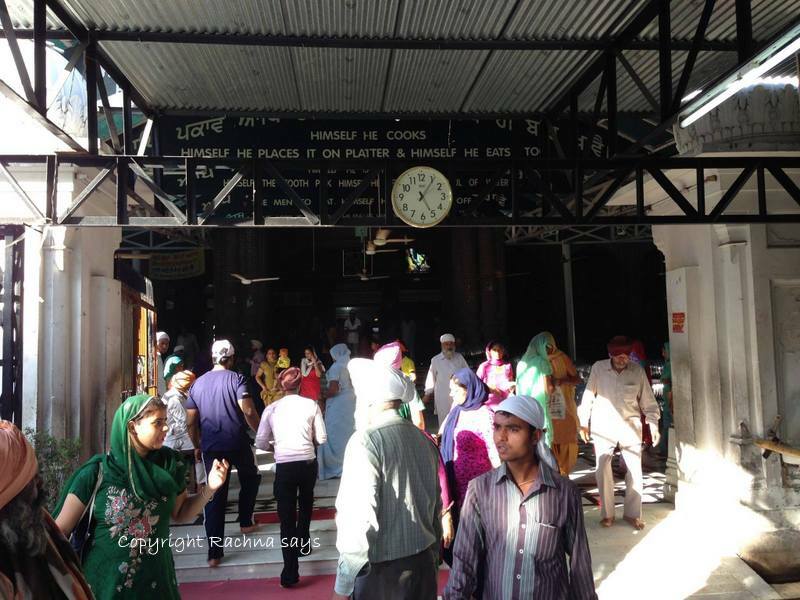 Golden Temple’s langar runs 24 hours every day and feeds everyone. Don’t forget to do your bit in supporting them monetarily. We headed to Kesar da Dhaba, another famous dhaba in Amritsar for dinner but sadly it was shut. I had some fond memories of the place from my last visit there. Its Dal Makhani is very popular. So we headed back to Brother’s Dhaba and had a simple Punjabi meal of Dal makhani, Rajma Chawal and rotis. You can’t beat the taste of Punjabi food in Amritsar. It is rich, very tasty and satisfying. We also shopped for loads of gastronomic delights like Amritsari wadiyan, masala, mongodis, heeng, pickles, dry fruits, almond oil and papad that we have been using back home for cooking. We visited the Jalianwala Bagh too. It has changed quite a bit from the bare bones structure that was there in the 90s. Walking through the place and seeing the bullet marks, the well which is now in an enclosed structure and reading through the various tablets makes one terribly sad. Walking through the narrow street through which the soldiers walked in and then opened fire on hapless people gave me goosebumps. Explaining it to the children was even more difficult. Why someone kills innocent people is way beyond comprehension of any human being. Ruchira, I remembered your post when here. Your grandfather’s words as told by me lingered in my mind. We did make two more visits to the Golden Temple next day in the morning just to sit there in spiritual silence soaking in the serenity and calmness that the place exudes. 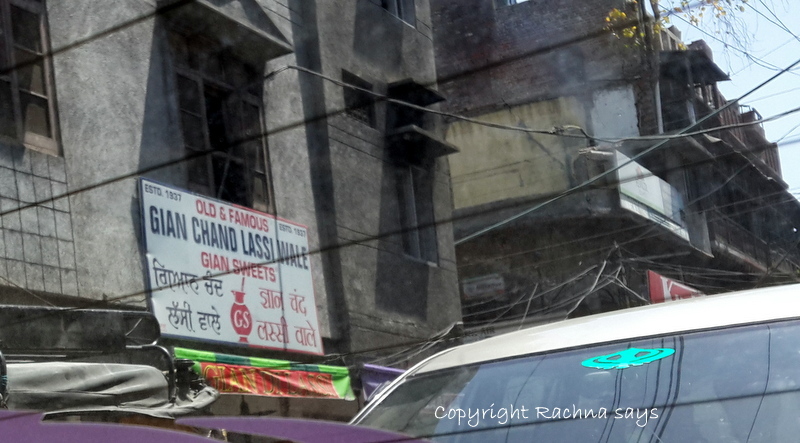 As we headed out next afternoon from Amritsar, we did get to try the famous Amritsari lassi at Regent. A huge refreshing glass of pure goodness, it came with an inch of malai/cream on top. Fresh and cool, the lassi sustained us till evening when on our way to Dalhousie we stopped at a dhaba to have lunch. The countryside in Punjab stretches all the way with lovely golden wheat fields that were waiting to be harvested. Baisakhi was next day and we narrowly missed the festivities in Punjab on that day. This brings an end to my foodie travels. Hope you have enjoyed reading this series as much as I have enjoyed visiting and eating at these places. hehe My mouth is watering too :). Amristar still remains one of my must-do’s. I have heard so much about the awesome food and the legendary hospitality of its people. I wouldn’t mind doing one with the Blogeshwaris. What say you? Yes, it is a place you must visit. It connects with me every time I go there. Would love to visit with all the blogeshwaris as well :). Amritsar is so close to my heart. We have been visiting the place since our childhood and have the fondest memories. And those kulchas …. yummylicious. Yes, I am imagine, Jas. Amritsar as a city is just so lovable. I can keep going back to it again and again. Punjab seems an interesting place. Only Pubjab I have seen so far is Bathinda – when on some project. Got to taste the awesome friend and got to see one of the Gurudwaras. But I guess I need to visit Punjab on vacation sometime too. Typo – read “friend” as “food” – but yes food is ever human’s best friend. So makes sense that way too though. Punjab wins you over with its hospitality. I have been to Jalandhar, Ludhiana and Chandigarh as well as Amritsar in the late 90s when I was working. And I found every place to be so warm and welcoming. Yes, you must go to Punjab on vacation. I’ve always loved food from the North, for the delicious parathas and Kulchas with generous amounts of ghee/butter and of course the milk sweets :-). Gives me another reason to take a short trip up there. And visiting Golden Temple has been on my ToDo List. Some day! You must. The food is spectacular and so are the people! I just came home from dinner and am already drooling. hehe I drool every time I look at the pics. Those kulchas are amazing :). LOL Achyut! I can imagine your trauma :). 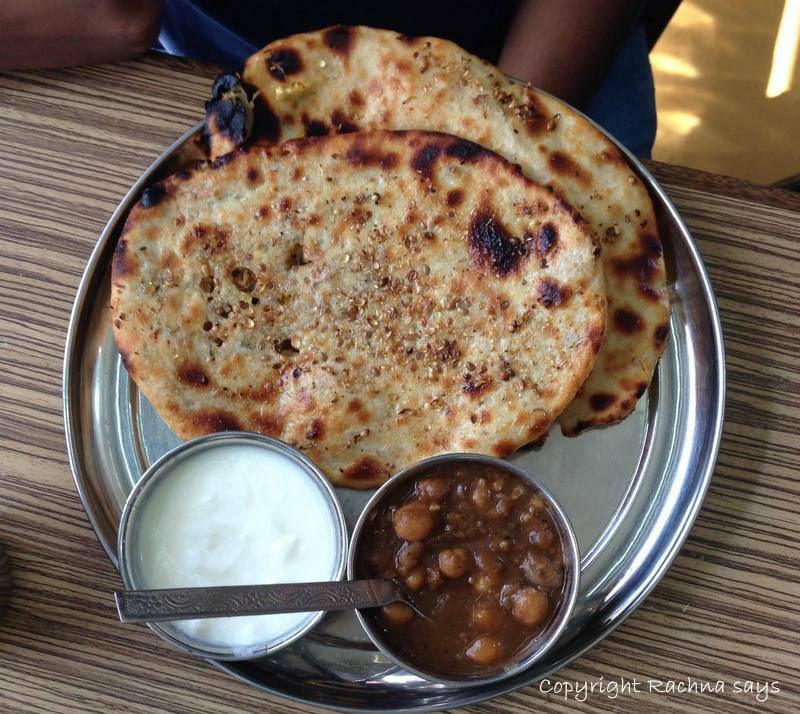 Amritsar is a foodie’s delight ! Thank you for including my post Rachna ! It indeed is. Ruch I had to include your post. It just had to be when I spoke of Jallianwala Bagh! Fabulous. Waiting to hear about your vacation, Seeta! The foodie series was fun, Rachna. Thank you so much, DC. Glad you enjoyed the series. Someday I hope you enjoy Amritsar just like I did. Indeed, I did :). Thanks for reading, simple girl! How did I miss this? If I miss it on FB I normally catch it on Indiblogger. Oho kee baat karde ho tussi! FB aur IB dono wich miss kar ditta. Chalo koi gal nahin :). I tell you I just love Punjab! Welcome back, Sid :). Somehow, as a city I always feel a connect with Amritsar. Of course, the food is just exceptionally yummy but it is also the people. You must visit there some day! And you know Naba, I got one phulkari and another suit stitched both patialas. Just love the lovely patialas and shalwars there. Some day you may love going there with S especially to the Golden Temple. Beautiful photos, Rachna…I particularly like the one of the wheat fields and tree. Apart from its aesthetic qualities, it is a good reminder of the earth and where our food comes from! And if there’s one place that gave me so much of peace and happiness, it has to be the Golden Temple!! ♥ it!! Wow Shilpa! That is just so amazing! You got drooling at the detailed account of your foodie vacation, Rachna! It seems like ages since I have had authentic dhaba food! Awww I had no clue you are going to Delhi in July. Are you coming to Bangalore as well. I loved all the foods I had on this vacation. Glad you enjoyed reading my account. hehe Jaish! Amritsar food is just yummy. I enjoyed this series of posts. hehe Yes, trust you to see the weed among the wheat. 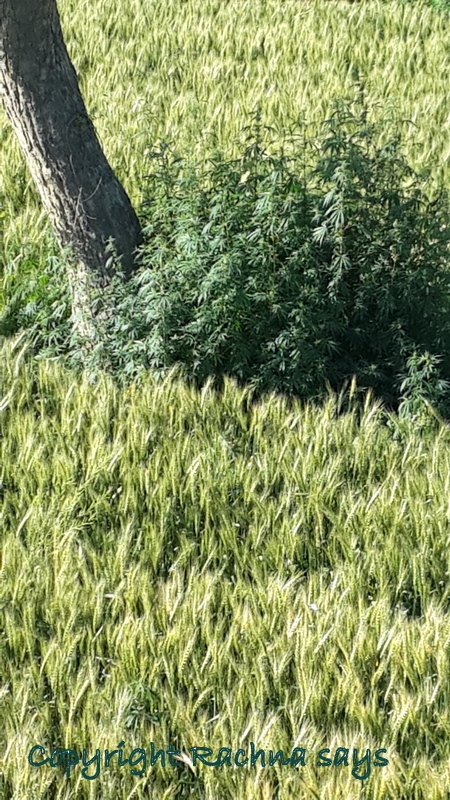 The weed seems to grow all over Punjab. It is alarming. Happy that you enjoyed the foodie posts!